Photography came to India in the 1840's, and many photographers suitably adopted the mores and conventions worked out by generations of British artistes, who had visited the Indian subcontinent from the start of the late eighteenth century. In 1815, MacKenzie was made Surveyor-General of India. His extensive work served to set the tone of the East India Company's involvement in a whole range of government-sponsored projects and eventually led to the hiring of professional photographers on a similar basis. In response to an appeal from the Royal Asiatic Society regarding the dilapidated state of the Ajanta caves, the Madras Military Establishment released Captain Robert Gill from active military service to make oil paintings exactly to the scale of the Buddhist Frescos in the early 1850s. What is interesting to note is that a few years later, the Madras Government supplied Captain Gill with a camera and within one or two years he became an active correspondent with the Journal of the Photographic Society of Bombay. After the publication of a book of Captain Robert Gill's photographic views, the Bombay Government in the late 1860's equipped him with a specially made rectilinear lens made by Dallmeyer of London and an 8 x10 camera. The wide-angle lens with short focus enabled Captain Gill to take photographs in the confined quarters and narrow entrances of the unique Hindu -caves at Ellora. By 1869 all the Presidencies of the States of Bombay and Madras had sponsored photographers for snapping Indian views in the field. Catalogues of the prints made by great commercial photographic firms of the 1870's and 1880's like Bourne & Shepherd, Johnston & Hoffman, Bourke, Sache and T A Rust appeared in the market throughout the British empire. By the end of the 19th century, many aristocratic Indian men had started taking to photography as a hobby more than as a profession. Indian women from upper class families also started taking interest in photography after 1910. Among some early women pioneers, we have to take note of the photographs of Mira Chaudhuri (1905-1994), Indira Dey (1912-1992), Manobina Roy (1919-2001), Debalina Mazumadar (1919) and Rajendra Kunverba (1920-2000). 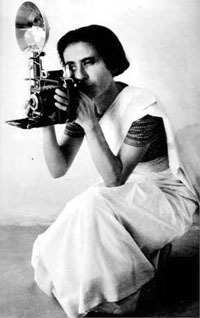 Homai Vyarawalla who was India's first woman Press photographer and who later in her career developed into a great photo-journalist belongs to this tradition. Photography has become so commonplace today that it may appear a bit naive to ask, 'What is photography?' Is photography an art or a mere mechanical process? Photography is more than tools and techniques. Joseph-Nicephore Niepce, whose experiments helped lay the basis for photography, conceived its function as merely 'to copy nature with the greatest fidelity.' Photography has also been called a language. This would mean that photography is a medium of communication, a method of recording events and conveying messages, a system of making known viewpoints, and opinions about reality. Every photograph is really giving a report on something. It may be a report designed to serve a utilitarian purpose. It may be a report designed to serve an inspirational purpose. Or it may be a combination of the two. As a great pioneer in the world of Indian photo-journalism, Homai Vyarawalla came out with great photographs starting from 1938 for over a period of 35 years till 1973. The lasting beauty of her photographs - 'whether utilitarian or inspirational' - can be summed up in one brilliant phrase of the great American poet Robert Frost: 'Art should strip life to form.' Viewed in this light Homai Vyarawalla was a great creator of photographic art in our country. Though the creative world of her works of art sprang from life, yet at the same time it represented a unique world of its own, serenely detached from the surrounding cauldron of clutter, clatter and confusion. Consequently her works of photographic art have preserved for posterity a beautiful slice of life that might otherwise have been dissolved in the constant flux and flow of reality in the never ending river of time. Homai was born in Navsari, a Mafussil town in Gujarat. Her father was an actor from the Urdu-Parsi theatre. The family was poor and her parents packed her off to Bombay for further school and college studies. Homai took an Honours degree from Bombay University and a Diploma in Art from J J School of Art. As a very young woman, she fell in love with another photographer called Maneckshaw and married him. She lived happily ever thereafter. Maneckshaw had a tremendous influence on Homai as a photographer. In an interview which Homai gave to Preeti Verma Lal, she recalled, 'I remember my first shot as a photographer, in 1938. A group of women from the Women's Club in Bombay had gone for a picnic party and I photographed them. My first published pictures were in the Bombay Chronicle - a whole range of pictures, for which I was paid one rupee in cash for each.' In the early days Homai would take photographs and her husband Maneckshaw would spend hours in the dark room at home to get the right colours. In the field of photography and photo-journalism Homai and Maneckshaw complemented and supplemented each other. Later, Homai started freelancing for the Illustrated Weekly of India. And its editor Stanley Jepson used to give her weekly assignments. In the early days for a fragile woman like Homai taking photographs in field situations was not easy. Her large-format Speed Graphic camera had a composite wood, steel and aluminium chassis, which used to weigh more than six pounds. Taking each photograph with this heavy weight equipment was indeed a heroic act of weight lifting. 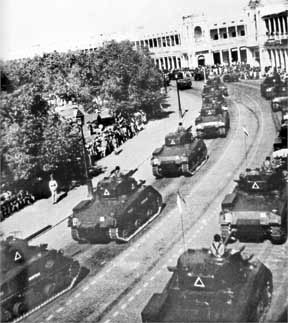 In 1942, Homai and Maneckshaw moved to Delhi to work for the British High Commission, then known as Far Eastern Bureau of British Information Services. From that moment Homai Vyarawalla became a permanent fixture at all major ceremonies - either government or private sector - and during the next 25 years she turned out her best work as a press photographer and photo-journalist. 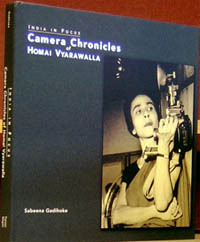 When Homai Vyarawalla dressed in an elegant Indian sari and armed with a Rolliflex camera, was hopping from place to place in the centers and corridors of power from 1945 to the late 1960's, she had the unique opportunity, normally given to very few press photographers, of catching on the camera great historical events and personalities ranging from Lord Mountbatten to Marshall Tito, from Queen Elizabeth to Jacqueline Kennedy, from Khrushchev to Kosygin, from Eisenhower to Nixon, apart from Atlee, Nasser, Chou En Lai and a host of others who have shaped the direction and contours of 20th century history. She took many delightful photographs of Nehru, Indira Gandhi and the other members of her family. Thus she herself became a part of history in the making, capturing World War II, India's Freedom Struggle leading up to independence and subsequently the hectic days of Jawaharlal Nehru and Indira Gandhi. Homai Vyarawalla lost her husband in 1969 and soon thereafter she moved to Vadodhara where she has been living alone ever since in total anonymity. She is over 93 years old today. It is exciting to read about her childhood in Bombay, her brilliant career as India's first woman photo-journalist and her subsequent retirement to Vadodhara. Homai has been living alone and in total anonymity in Baroda during the last three decades. She was persuaded by the Parzor Foundation, dedicated to the preservation of Parsi-Zoroastrian culture and heritage, to share her memories and photographs with the world in the form of a book. Parzor chose Sabeena Gadhioke of Jamia Millia University as the researcher and writer. Sabeena Gadhioke has done full justice to the creative life and times of Homai Vyarawalla. Many do not know that Nehru was a chain-smoker. We get a very interesting glimpse of Nehru in a relaxed and informal mood with a burning cigarette on his lips, in Homai's photograph. 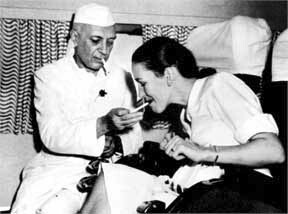 This photograph shows Nehru lighting a cigarette on the lips of Ms. Simon, wife of the then British High Commissioner to India. The photograph was taken inside the BOAC Boeing on its inaugural flight to London from New Delhi. It is difficult to find words with which to pay tribute to the indescribable genius of Homai Vyarawalla. Always moving in joy and child-like simplicity, she produced her great photographs in an effortless and exquisite manner, which always reflected and radiated the ecstatic quality of her soul. Her work will continue to speak and proclaim for centuries. It is a nice feature article on Homai Vyarawalla, but it requires more about the personal life and awards awarded to her.